"I saw Mommy kissing Santa Claus / Underneath the mistletoe last night. / She didn't see me creep / down the stairs to have a peek / She thought I was tucked up in my bedroom fast asleep." I've got two cards to show you today featuring holiday releases from CAS-ual Fridays Stamps. 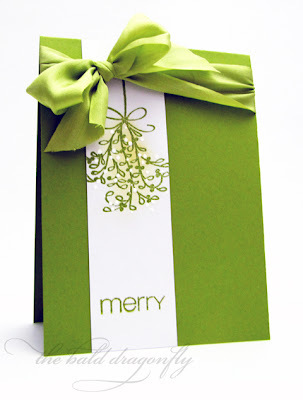 The first card uses Merry Kiss-Mas. I stamped and embossed the mistletoe image onto a panel of white cardstock and then added a touch of depth with some light yellow sponging in the background. I finished complimenting the image with a few dots of white Enamel Accents. 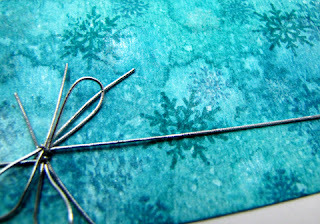 After stamping the a portion of the "merry kiss-mas" sentiment from the set, I adhered the panel to the card base and finished it all off with a big silk bow from May Arts. I was really inspired by this beauty here! Young Crafters Unite is hosting a Holiday Card Challenge, and since I'm actually going to be sending this one out this year, I thought it would be a perfect fit! The second card is my *first* attempt at the chalk board technique wonderfully shown in Betsy's tutorial here. I chose to work with images from the uber fun and stylish Countdown set from CAS-ual Fridays Stamps. I stamped and heat embossed one of the many border strips from the set as well a sentiment, then came back and added a shadow with white ink. I then colored in some of the bubbles with colored pencil and finished with the "chalk." 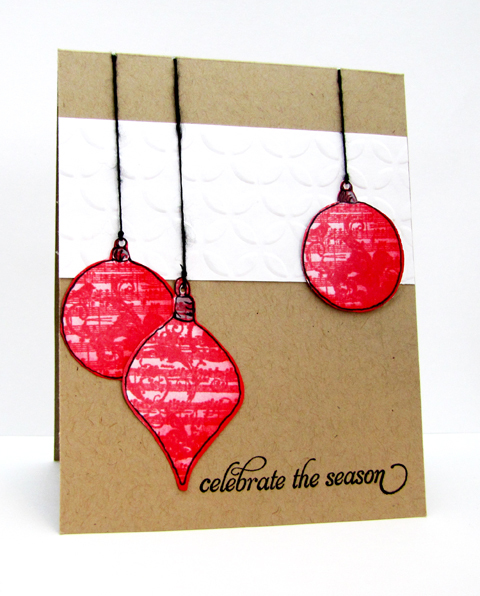 Two super fun holiday sets from CAS-ual Fridays Stamps...two totally different cards. 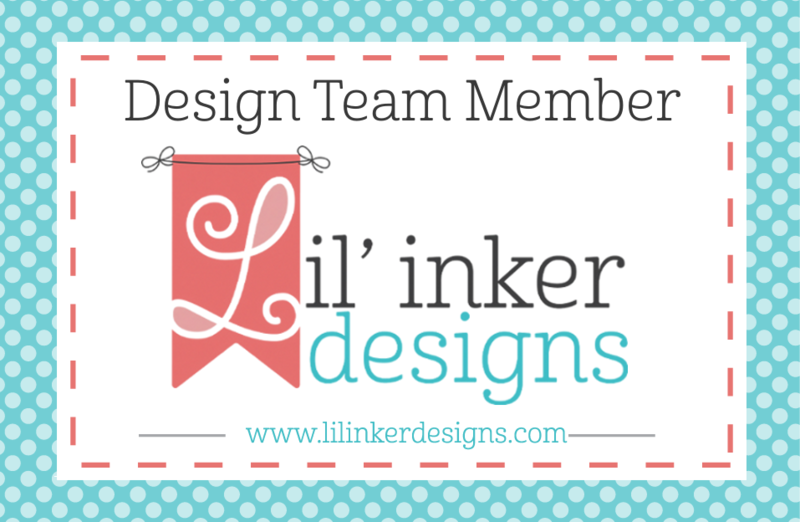 Have you arrived from Julie Ranae's blog?! Yes?! Great, then that means you've been following The Craft's Meow November Release Blog Hop! If not, no worries, the complete hop list can be found on The Craft's Meow Blog. First, I'd like to say thank you for words of encouragement left on my blog and The Craft's Meow Blog on Zoom Goes My Heart! I love creating sets that can be used over and over, and ones that fill a void in the market. Thank you! I've got a one layer, clean and simple card today that features two sets from this release, Valentine Wishes and Stitched Sentiments Two (which is November's gift with a $50 purchase!). 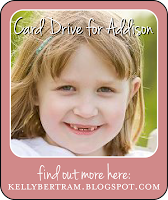 These are such sweet images and reminded me of a little girl that could use some kind thoughts in the form of cards. 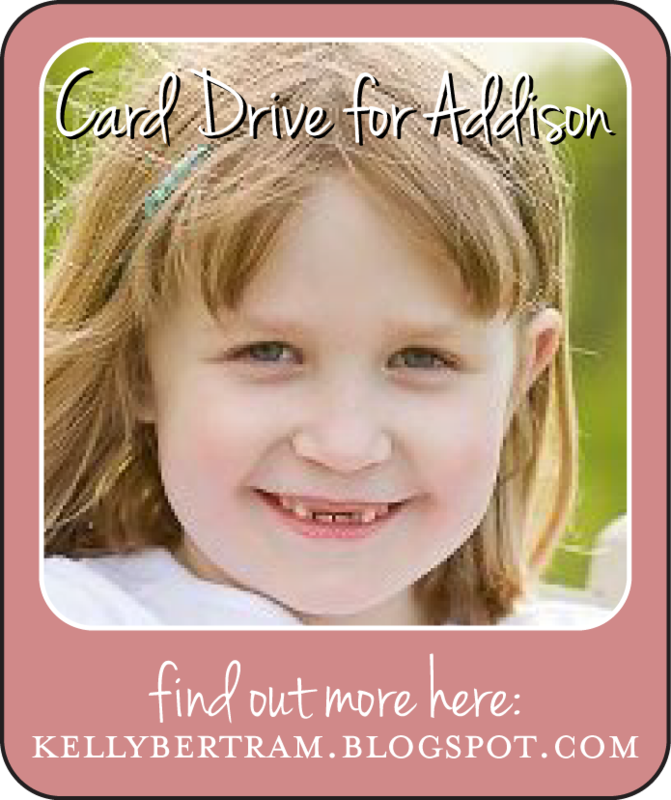 Please consider sending some cards to Addison! You can find out more details here on Kelly's blog. 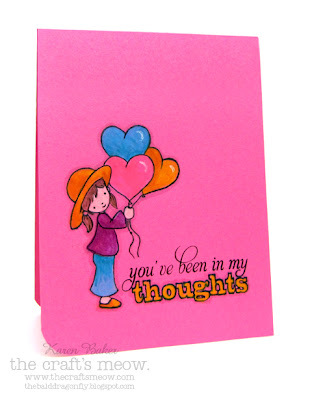 I stamped one of the larger girl images from Valentine Wishes onto a pink card base and then colored her with colored pencils, adding some white gel pen highlights to the balloons. Then I stamped the sentiment and connected the dots on the word "thought" so I could color it in. A rounded corner finishes the card off. I hope it will put a smile to Addison's face. I'm entering this card into Moxie Fab World's Keen on Neon Challenge, as the colors were inspired by it. By participating in today's hop and leaving comments on the design team member's blogs by 9:00 PDT, Sunday, December 2nd, you have a chance to win each of the four sets released this month! Your next stop on the hop is our guest designer, Kim Duran! In my childhood home we had a fireplace with small terracotta colored tiles for the hearth. I remember being fascinated that some big, chubby man could fit down the dirty chimney, hardly leaving a mark except for the vast amount of gifts and half eaten cookies he left behind. One year, though, he was not so careful...he left sooty boot marks leading up to the tree from the fireplace...Many, many years later at my own house, the same man left a white glove on the end table by the plate of cookies. Oh, the magic of "Santa"! CAS-ual Fridays has a new challenge up, which is perfect for the approaching holiday: Create clean and simple gift tags! There is fun eye-candy available on the CAS-ual Fridays Blog as each Girl Friday has totally outdone themselves with this challenge, and you can catch up on the challenge details, rules and prize information there too! We have a new sponsor this week! 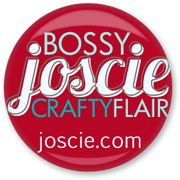 bossy Joscie crafty flair! 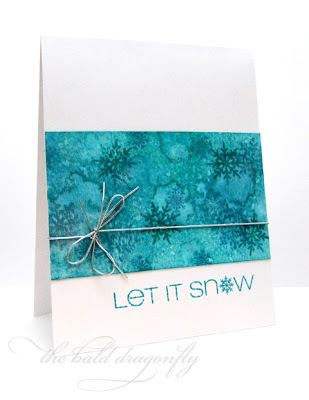 My tag features a lightly stamped background and sentiment from the gorgeous Snowflake Greetings stamp set available at CAS-ual Fridays Stamps. 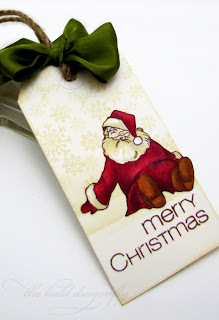 The very tired looking Santa is from Lil Inker's Dear Santa Set and the tag is tied with May Arts Silk Ribbon and Twisted Burlap. Every day I drive thirty minutes to work, starting at the same dashboard for years and years. It is my quiet time to think, and my thoughts usually turn to stamp design. As a designer of stamps, I'm always on the lookout for missing items, themes or sets in my large arsenal. What I sorely lacked was a set "for the guys," especially a Valentine's set, and one day I realized that it had been staring at me in the face on my drives to and from work! It is the fourth day of The Craft's Meow's November Release! (You can read more about the releases at The Craft's Meow!) The design team members are showcasing a fun, versatile set called Zoom Goes My Heart, designed by me. I think this set is perfect for the Mr. in your life, the boys in your life...or those ever-elusive masculine cards. Not only does it contain some valentine's sentiments, but also has birthday and anniversary usage as well! 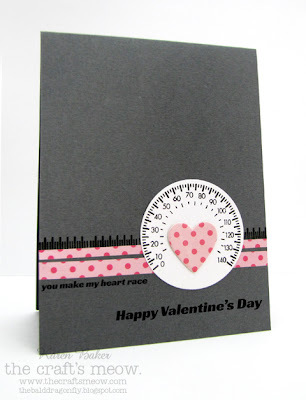 For my card today, I stamped one of the speedometer images with black ink onto a die cut circle and mounted it behind two strips of pink patterned paper onto a grey card base. A heart was die cut and then mounted to the speedometer for a bit of whimsy. I also chose to add an additional detail by stamping a line of pegs too, and then finished the card with two sentiments from the set. I'd love to hear your thoughts on this set, you can see more of it showcased on the participating design team members' blogs, as they did a fabulous job. You can be eligible to win Zoom Goes My Heart from The Craft's Meow by visiting the blogs and leaving a comment! Sometimes they can go for months, tucked away in the deep depths of the cabinet under the kitchen sink. Brightly colored bottles lined up, standing tall and still...just waiting for the little boys to discover them once again, grab them with their hands and treat them like they are the best thing ever. Yes, bubbles are a staple at our house for those times when no other toy chases the boredom away like a jar of bubbles. I started with a blank white card base and misted it with spray ink. The spray ink gave me a guide to stamp the little bubbles, as I tried to cover up the biggest blotches of ink, carefully turning the bubbles every so often for a random look. 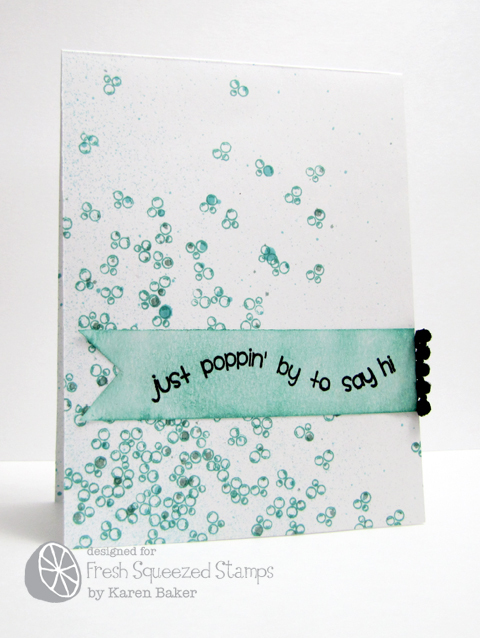 I finished the card with a fun sentiment panel and a little pom pom trim available at May Arts. Please stop on over to the Fresh Squeezed Blog for more information about this super fun set and pop on by their Facebook Page and say hello to Fresh Squeezed Stamps on their Twitter Page too! Thanks once again for Ryann and the Fresh Squeezed team for inviting me to showcase their amazing stamps this month! Grandma has a peony bush that grows outside under her windowsill year after year in the summer, I remember loving the big blooms as a child, and it is no different twenty plus years later. My grandpa has even added his touch: a chicken wire fence with arrow posts. It is the third day of The Craft's Meow's November Release! (You can read more about the releases at The Craft's Meow!) The design team members are showcasing a beautiful set designed by Nina called Beautiful Shelf. In my quest to make my grandmother some more cards to send to her family members, I chose to focus on the beautiful vase full of flowers from the set. 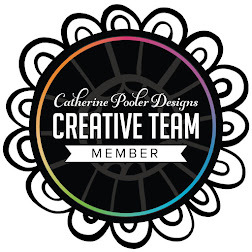 I stamped the image first onto a die cut circle and then used chalk to highlight the outside of it. I went back in and colored the vase and blooms with marker, and added some pearl mist when it was all said and done. The circle was then mounted to a card stock vase and to complete the card I stamped a sentiment from Inspired by Audrey, mounted it to a panel and then attached that to the base. So happy that you stopped by today to help celebrate the November Release from The Craft's Meow! You can be eligible to win Beautiful Shelf from The Craft's Meow by visiting and leaving comments on the participating design team member's blogs. I know that I have to hold onto these days tight. These are the days that my youngest still thinks it is all right to give his mama a big hug, and a wet, sloppy kiss. These are the days that his little heart shows his big love for his mama, instead of keeping it closed up tight. I'll take those hard, tight hugs and big, sloppy kisses...as many as he wants to give me. This card features everything from the Artful Delight November Card Kit! 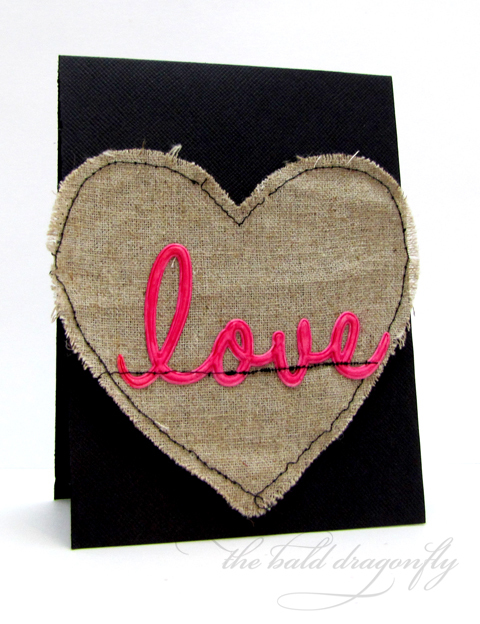 I colored the "love" word with markers and stitched it onto the canvas heart and then onto the card base. Makes quite an impact, don't you think...especially with the bold black card base? 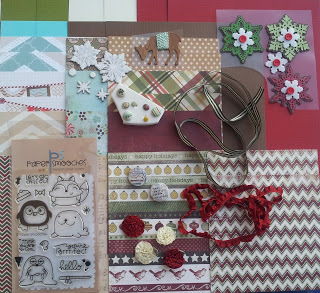 The December Kits were revealed yesterday on the Artful Delight Blog, and you can check out all the details here! 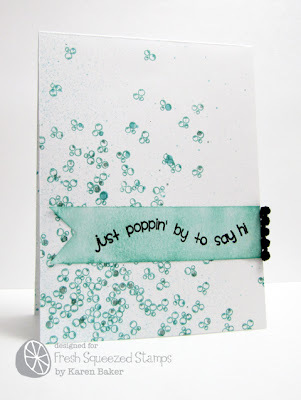 The card kit contains a plethora of fabulous patterned paper and look at that cute Paper Smooches Stamp Set! I'm really looking forward to playing with this kit and bringing you some tips and tricks/tutorials for the month of December! The new sketches will be revealed on the first of the month on the Artful Delight Blog, and you'll have a chance to win one of these kits if you play along. Delicate little creatures song birds are...if it were only warm enough to lay still on the grass close my eyes and just listen for their equally delicate tunes. A relaxing, joyous and uplifting sound such as tat of a songbird could make me forget some of the trying times as of late. Welcome to the second day of The Craft's Meow's November Release! (You can read more about the releases at The Craft's Meow!) The design team members are showcasing a beautiful set designed by Nina called Stitched Sentiments Two. 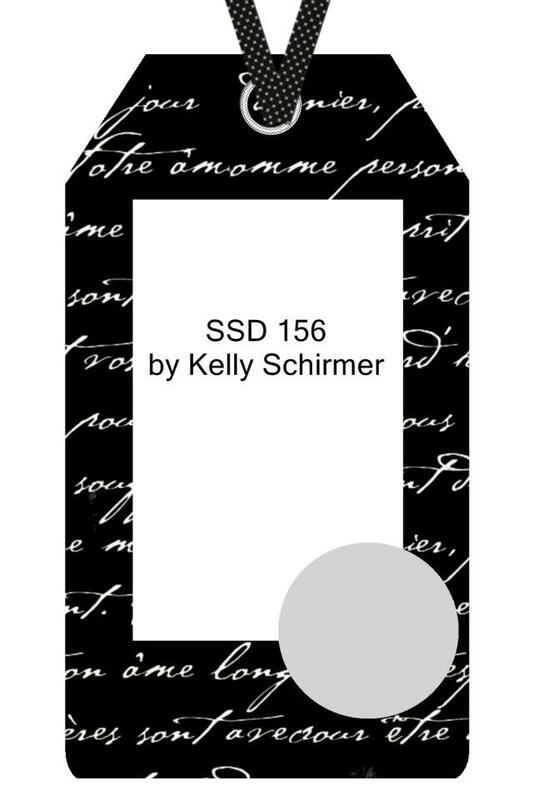 You can see the first Stitched Sentiments here, and find that this set is a perfect addition! This card was really simple to make, but I think it packs a punch and gets its meaning across. The sentiment was centrally stamped and then I stitched with black thread a line for the die cut bird to perch on. Before adhering the bird, I shaded his breast with a bit of orange/yellow, the complimentary color of the card base and an ode to the beautiful bluebird. So happy that you stopped by today to help celebrate the November Release from The Craft's Meow! You can be eligible to win Stitched Sentiments Two from The Craft's Meow by visiting and leaving comments on the participating design team member's blogs. 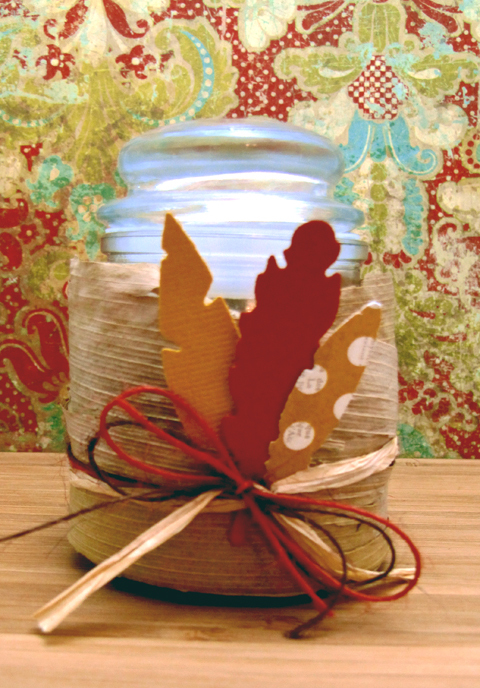 If you are in the mood for some Christmas Holiday Inspiration, May Arts has teamed up with Little Yellow Bicycle this week. My most favorite May Arts project ever was posted yesterday, and you have a chance to win products from each company by posting a comment over on the May Arts Blog! "Let there be peace on earth and let it begin with me. Let there be peace on earth, the peace that was meant to be! With God as our Father, brothers all are we. Let me walk with my brother in perfect harmony. " Skipping Stones Design is celebrating their new release Victorian Christmas with a hop and a Tag Sketch Challenge. If you are following the hop, you should have arrived from Stephanie's blog, otherwise you can find the starting details, along with the challenge information on the Skipping Stones Design Blog. Unfortunately the new set didn't arrive in my mailbox on time for this hop...but I'm featuring two other great holiday sets on my tag from Skipping Stones Design, Brrrthday and Christmas Song. I stamped the cool snowflakes from Brrrthday to create a patterned paper background. Then I came back and added the sentiment from Christmas Song. I punched a circle from the tag and backed it with some green paper that had been twice stamped with some more snowflakes, and completed the look with a rhinestone. 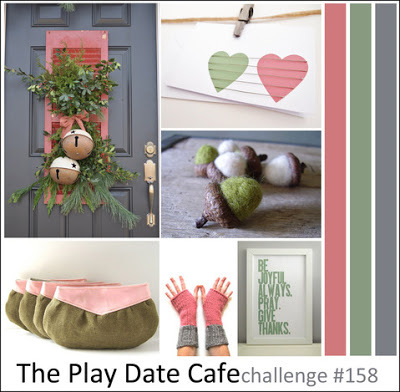 The colors came from the latest Play Date Cafe Challenge, a nice twist on the traditional holiday colors. I hope you have a chance to follow along on the hop today and play along with the Skipping Stones Design sketch too! The next stop along the hop is the very talented Tesa! "Little girls are made of daisies and butterflies and soft kitty cat purrs, and all the precious memories of times that once were. Little girls are made of angel's wings and giggles and firefly's glow and all the happy feelings, deep inside, that we all know. Little girls are made of cinnamon and bubbles and fancy white pearls and snowflakes and rainbows and ballerina twirls. Little girls are made of sunshine and cupcakes and fresh morning dew, and these are the reasons, little one, why everyone loves you." The Craft's Meow's November Release starts today! (You can read more about the releases at The Craft's Meow!) The design team members are showcasing a sweet set designed by Mabelle R-O called Valentine Wishes. Isn't that little girl the sweetest? I've used this technique before with Mabelle's images and I love the result each time. I stamped and fussy cut the girl image onto white cardstock and paper pieced the heart. Just a touch of blush colored marker was added to her cheeks. 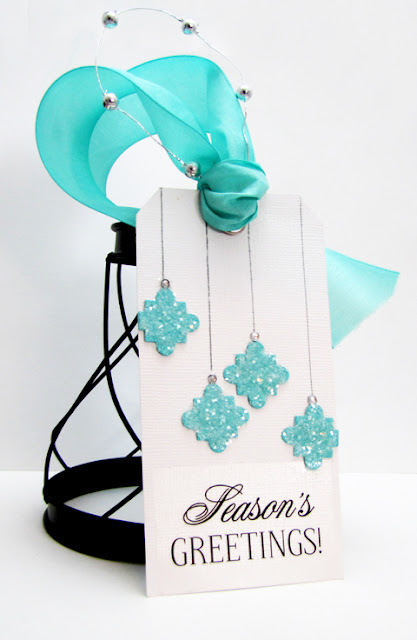 She is set off with a patterned paper background and stands on some die cut grass and luscious May Arts silk ribbon. 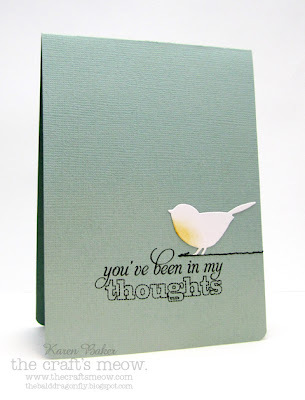 One of the many sweet sentiments included in the set was stamped to finish off the card. So are you super excited about this month's release from The Craft's Meow? So glad that you stopped by today to help celebrate! 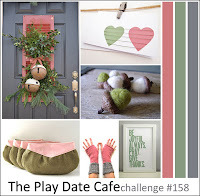 You can be eligible to win Valentine Wishes from The Craft's Meow by visiting and leaving comments on the participating design team member's blogs. No Black Friday Shopping for me today...they've made some changes at work so that is where I'll be. Wishing everyone else that goes though good luck! 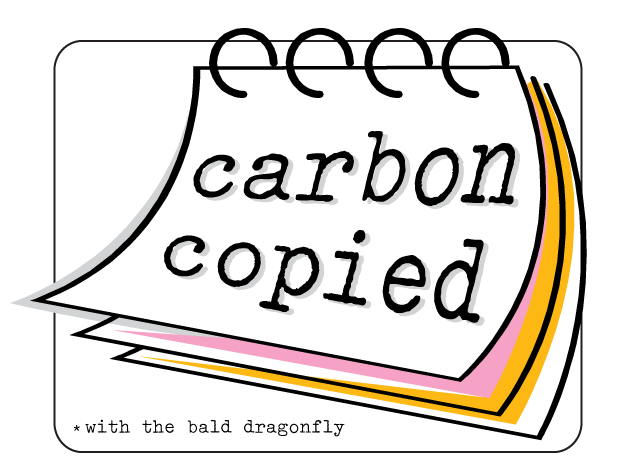 Today I have the pleasure of sharing a Carbon Copied post with the fabulously talented Andrea M. from Work In Progress! 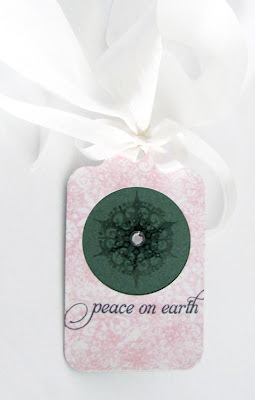 We are both participating in Jay Gee's Nook Challenge using Papertrey Ink's Quarterfoil Die Cover Plate. Instead of using the die of the whole plate, I isolated some of the cut out because they reminded me of the shape of the blue ornaments in Jay Gee's Nook's Challenge picture. After die-cutting, I covered them with glitter, adhered them to the tag base, drew lines for the string and topped the ornament with a silver rhinestone. The sentiment is an SRM Sticker, and the fibers and pearl toppers are from May Arts. I absolutely cannot wait to see how the Quarterfoil Die Cover Plate and Jay Gee Nook's Challenge Inspiration Picture has inspired Andrea. I'm sure it is stunning, as is all of her work! I hope you get a chance to pop on over to Work in Progress and check out her post! Proud as a peacock...must derive from the feelings of fathers as they walk their "little" girl down the long church aisle and hand her off to her future husband. Granted, that must be after they get over the initial sadness? 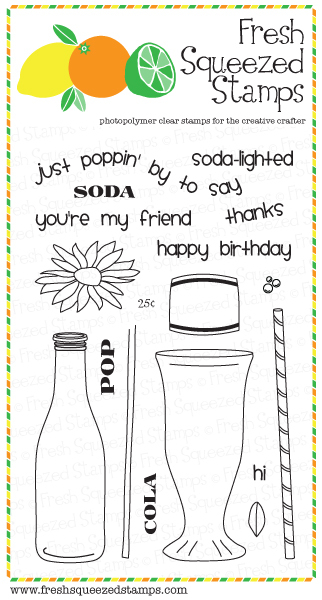 Thrilled to continue guest designing for Fresh Squeezed Stamps this month. The second set from Fresh Squeezed Stamps that I got to work with is called Tickle My Fancy and is full of lush feather images in different styles, along with some great corresponding sentiments. I seem to really enjoy working with feathers lately so this set is just my style! 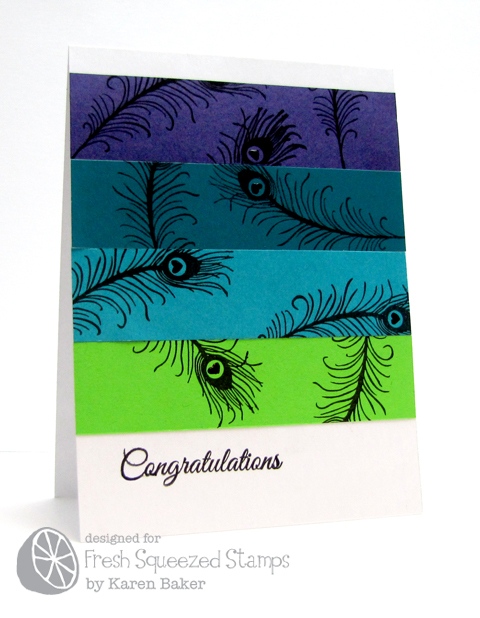 For today's card I stamped a bunch of the peacock feathers onto scraps of brightly colored card stock and then assembled them onto a card base in a color block style. 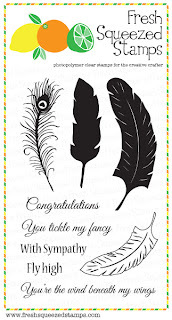 I added a touch of glossy accents to the heart center of each feather. 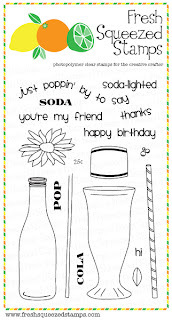 Please stop on over to the Fresh Squeezed Blog for more information about this super fun set and pop on by their Facebook Page and say hello to Fresh Squeezed Stamps on their Twitter Page too! Wishing all a Happy Thanksgiving today to those celebrating! Did you ever watch Mash? For some reason the image of my mother folding loads and loads of laundry while Mash was on the television pops into my head. Anyway, Alan Alda aka Hawkeye has been quoted: "Laugh at yourself, but don't ever aim your doubt at yourself. Be bold. When you embark on strange places, don't leave any of yourself safely on shore. Have the nerve to go into unexplored territory." The one thing I really liked about the November Card Kit, available at Artful Delight, is that not only is it packed full of great products but some of the papers I wouldn't necessarily have gravitated towards individually. Like the bold yellows and strong blue patterns. However, after putting them together along with the background stamp from the kit has me patting myself on the back for being bold! (Everything is from the kit except for the sentiment stamp and ink, I also used the layered die from PTI to create the flower). 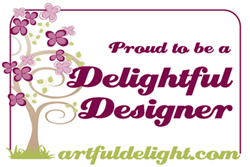 Please stop on over to the Artful Delight Blog because I hear there is a giveaway involved for the remainder of the month (LeeAnne's giveaways are always thee best!) and...There is just a wee bit of time to play along with the two sketch challenges posted over on the Artful Delight Blog. We are nearing the end of fall here in Central Wisconsin, marked by bare trees, a few snowflakes that melt before they hit the ground and bitter cold air. 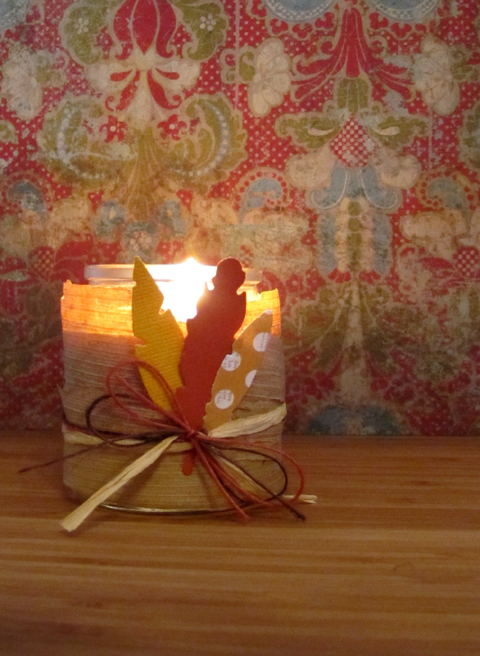 I brought some warmth inside with a corn husk wrapped candle with the help of Helmar and May Arts, who have teamed up for a two day inspiration parade! I'm the first stop on the second day of the Hop, however, you can find all the details on the May Arts Blog or Helmar's Blog! 1. I started with a few supplies. I purchased a small candle with lid at a local discount store, removed the label and washed it. I also had some corn husks on hand as well as some cut patterned paper feathers and May Arts Burlap String and Raffia. 2. 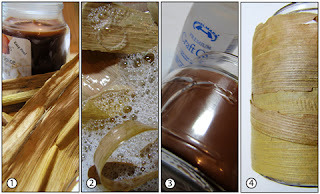 I then soaked the corn husks in a mixture of dish soap and water to clean them from debris. After patting dry I wiped them with a bit of oil to keep them pliable, and removed any excess with a towel. 3. I started the application of the corn husks to the glass by laying a line of Helmar's Craft Glue directly onto the glass. I love this glue. It acts like hot glue without the hot mess and dries just as quickly! 4. I then wrapped the corn husks around the glass, applying more glue as needed, until most of the glass was covered by the husks. 5. The final decoration was to wrap the corn husks with some May Arts Raffia Ribbon (this comes in an awesome, workable spool, not wrapped up in a bag!) and Rust and Dark Brown Burlap String, securing with a bow. Then I tucked the paper feathers in, adhering with a touch of Helmar's Craft Glue. I also make a card to go along with my candle. A piece of husk was adhered to a card stock using Helmar's Craft Glue and then die cut. 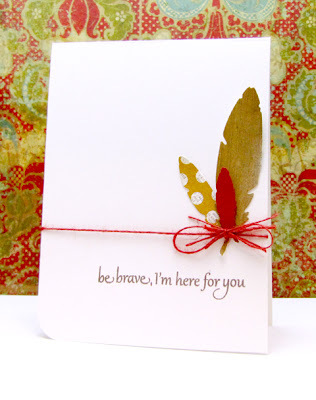 After die cutting a few more feathers and stamping a sentiment, I adhered the feathers to the card stock base and tied it all off with some May Arts Rust Burlap String. Please be sure to comment on any stop along the way as there is amazing prizes of ribbon and adhesive to be won! More details are on the May Arts Blog, and you can find the rest of the blogs from yesterday and today there as well! Your next stop is Martha Richardson! For a wedding gift (we were married three days before Christmas) I received a box full of wonderfully delicate and detailed glass ornaments. I proudly displayed them for a few years until the little ones arrived. They've been kept safe in a padded box and I'm excited to think that this year I'll be able to take them out! There's a new sketch up on the Skipping Stones Design Blog, you can check out the details, rules and prize information here, along with gorgeous samples from the design team and guest designers! 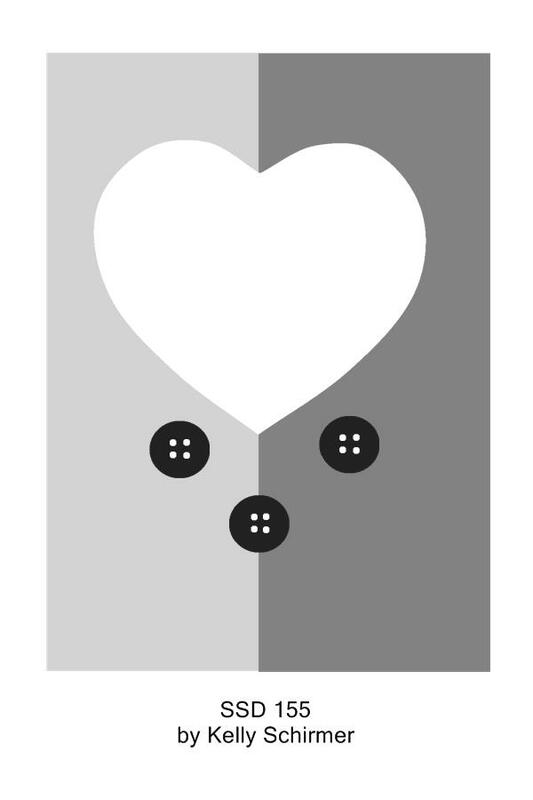 I chose to focus on the three buttons from the sketch and used the ornaments from Christmas Song. The heart background I transformed into a strip of white cardstock that has a slight embossing to it. The ornaments were stamped in red ink and shaded with pink and red inks. I drew the black outline for some definition and they were then fussy cut and applied to the card with some string. I hope the sketch inspires you to play along! If there was one object, living or otherwise, beyond the scope of my family, that instantly makes me feel happy, safe, secure...it is a bluebird. Bluebirds will always hold a special place in my heart. I've got a fun Just Because card that is reminiscent of a bluebird. I used the Lifestyle Crafts Quick Cuts Feather Die. Nothing fancy, I just ran a piece of white cardstock with the die taped in place evenly and let the layout of the die do all the work. Kind of cool, huh? 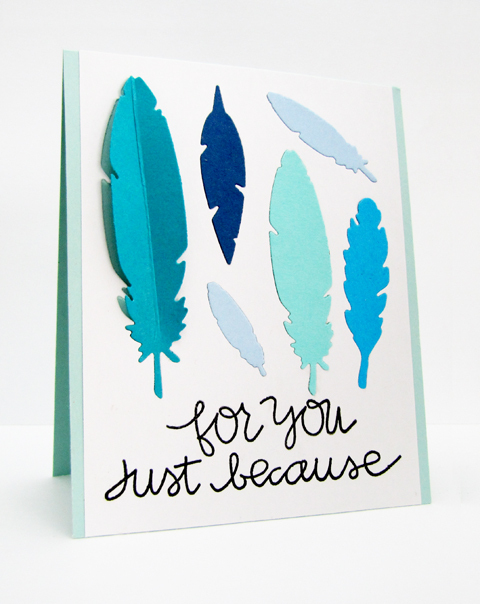 After the white panel was adhered to the card base and the sentiment stamped, I went back and ran some other monochromatic blue cardstock through with the Feather Die and adhered them on to the card base as well, with the exception of the large teal feather. That was first scored down the middle and bent slightly before being glued on. Lifestyle Crafts has given me a code to share with you...enter the keyword DRAGONFLY for 20% off! Now is a grand time to check things out over there because they are celebrating some great news and are sharing their excitement with a free shipping offer. Now I know I won't be seeing any bluebirds around these parts for a couple of months, so I'll have to stick with creating some cards that make me feel happy, and this one does. Oh the weather outside is frightful, but the fire is so delightful, and since we've no place to go, let it snow, let it snow, let it snow! I can say that now, when it is just cold outside with a splattering of a few snowflakes, but I'm pretty sure that when it actually does fall and accumulate, I might curse at it for a while! Wisconsin winters really are kind of frightful! Back today with a new challenge to introduce at CAS-ual Fridays: Use blue in your winter related projects! It is a two week challenge, so there is plenty of time to play over the holiday. More details and a mound of amazing inspiration can be found over on the CAS-ual Fridays Challenge Blog. Our sponsor this week is CAS-ual Fridays Stamps! I used a new November release set called Snowflake Greetings, which just became available in the store. I'm sure that you can see if you've followed my blog lately that I'm trying out some new techniques, getting out of the normal funk I was in. (Is that a good thing?) I've been using more fiber and experimenting with distress inks. This panel was created by laying down a mix of blues onto watercolor paper, spraying with some pearl mist and then stamping snowflakes with the excess pearlized water. I then dried the panel and came back to stamp with various blue and white inks. I think it turned out really pretty if I do say so myself, and patting myself on the back because I think I kept the card clean and simple with its design-a great combination! I can't wait to see your Winter Blues creations, please link them up to the CAS-ual Fridays Challenge! "Soon after Jesus was born, wise men were traveling on their camels; one night they noticed a very strange star in the sky. They knew that this star meant that the King of the Jews, the One who would save the world had been born...The wise men left to find the baby. They didn't know exactly where the baby was, but at night they followed the star in the east. They followed the star until it hung right over the very place where Jesus was." ~Exert from here. Skipping Stones Design offers a really cool stamp set called Wisemen. 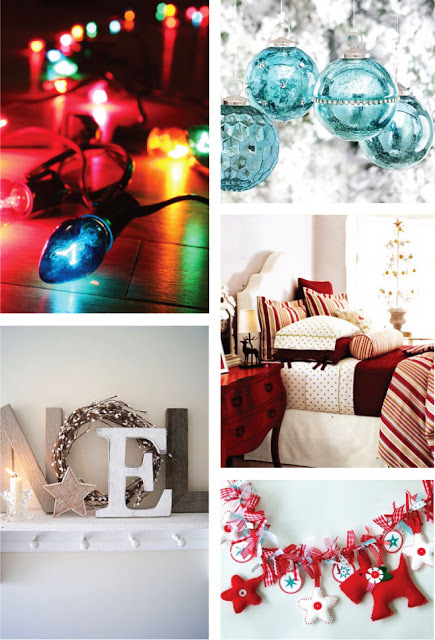 It is perfect to use on those projects where you want to convey the true meaning of the holiday. 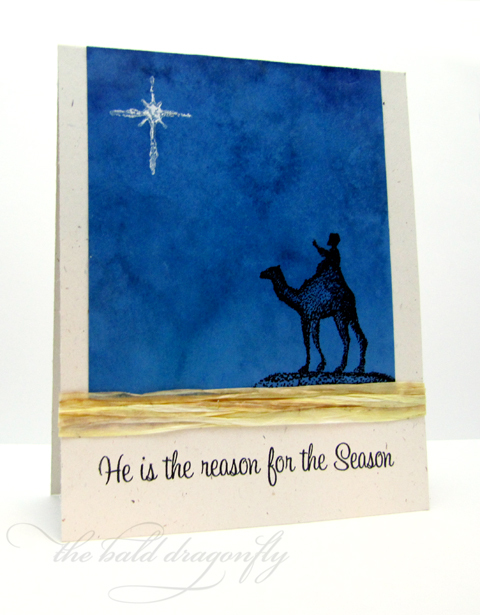 I started my card with saturating some watercolor paper with a mixture of blue inks and spray and after letting it dry I stamped the wiseman in black ink and the star in white. I added some glitter to the star and wrapped the card with some May Arts Raffia ribbon. I think I mentioned before that my grandfather used to have an authentic soda pop machine in his garage and the highlight of going to their house was when he gave each of us a dime and we got to choose our flavor: orange or rootbeer. Nothing was as good as opening the bottle with the little opener right on the machine and taking a swig out of the glass bottle. I'm back today with a card created with the fun Fresh Squeezed Stamps Soda-lighted sett that brings back so many memories. 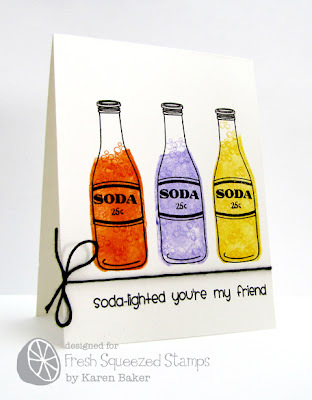 My card features stamping onto the back of the soda bottle with a colored ink and then coming back to stamp with a black ink the correct side of the stamp. I added the fun bubbles in respective inks, the label and the sentiment. 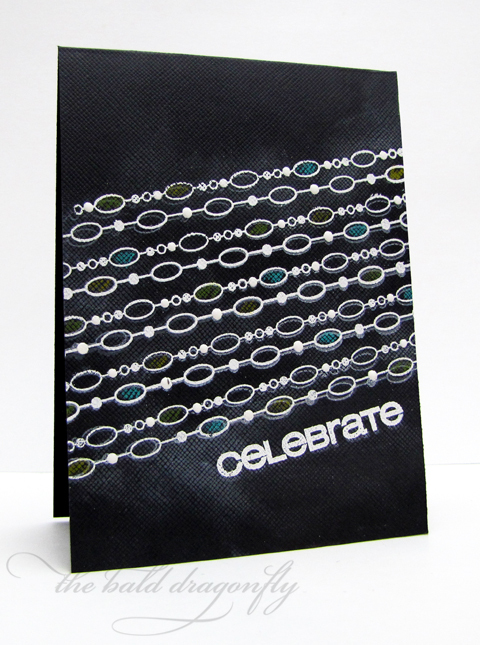 The card is finished with a single strand of black floss tied in a bow. It's been fun to guest design for Fresh Squeezed Stamps for the month of November, along with the talented designers Chari Moss, Arielle Gordon and Lynn Put. Fresh Squeezed Stamps and I have a few more posts scheduled for the month. Please stop on over to the Fresh Squeezed Blog for more information about this super fun set and pop on by their Facebook Page and say hello to Fresh Squeezed Stamps on their Twitter Page too!